I am writing an article to post here to be called “Generation by generation – are things getting better or worse?” Obviously this needs to take into account what is happening about “intergenerational fairness”. But what does that term mean? I started with “Intergenerational Fairness Index – Measuring Changes in Intergenerational Fairness in the United Kingdom” from the Intergenerational Foundation, since its title matched what I wanted. But it actually demonstrates what not to do! I’ve written a commentary (below) on that document in order to discuss what “intergenerational fairness” means and how to measure it. The document (26 June 2012) is available as both a PDF and a Word document at 2012 Intergenerational Fairness Index. I’ll call it “the IF Index” for brevity, although that is really the name of the Index that it documents. 1. The IF Index doesn’t define “generation” or “young”, and certainly isn’t consistent in their use. It says “It has not been possible to define the young in the same way across the sets of data which are available but we do not believe that the differences would materially affect our results”. Yet it variously uses data for “students achieving … grades at GCSE”; “students in Higher Education”; “those aged 20 to 29 (22 to 29 from …)”; “those aged under 25″; “those aged 25 to 34″; “the UK workforce”; “those aged under 60″. All of those people are important, but they comprise different generations which are sometimes in conflict with one-another. All they really have in common is that they are not retired pensioners. And if the IF Index is intended to be “anti-pensioner” or “anti-baby-boomer”, that may be the point! 2. The IF Index doesn’t attempt to define “intergenerational fairness”. Since there isn’t a consensus about what that means, it is hard to validate whether it really is measuring it and whether it being consistent. Presumably the term is related to Intergenerational equity, but the IF Index doesn’t explicitly use that as its scope: some of its topics are not about “relationships between children, youth, adults and seniors, particularly in terms of treatment and interactions”. It isn’t automatically “intergenerationally unfair” for one generation to have different characteristics from another. (The shorter life expectancy of earlier generations isn’t “intergenerationally unfair”). It becomes “unfair” when undesirable differences arise because of “treatment and interactions”, especially undue transfers of resources. There needs to be an element of cause and effect. (So the the shorter life expectancy of earlier generations would be “intergenerationally unfair” if it were caused by undue power of later generations, which it isn’t). 3. The IF Index doesn’t attempt for any measure to define what is the “fair” value. It takes the value at 2000 as a base, then anything that it judges to be a worsening from that position for its favoured groups registers as unfairness. There are at least 2 problems with that method: the level in 2000 may have been unfair the other way and the changes may actually be increasing “intergenerational fairness”; and demographic and other changes may be changing the “fair” value over time. 4. Some of the topics that the IF Index discusses appear simply to be observations about society, and nothing to do with generations or fairness. They may or may not be interesting, but they appear (given the lack of definition) to have no place in a document about “intergenerational fairness”. No justification has been provided for including them in the overall measure, or even in the IF Index document itself. There is no evidence that the young people concerned were consulted about their own views of what measures are important and/or of what they consider to be fair. 5. There is no demonstration that the numeric values of the individual measures have equal significance. For example, a 1% change on one measure may have as much practical impact on young people as a 10% change in another. Therefore the validity of simply adding up the Component Measures hasn’t been demonstrated, and is almost certainly wrong. Purpose: To assess levels of unemployment amongst younger people compared to the UK average. Purpose: To assess levels of affordability of UK housing amongst younger people. No particular comment. (We need more houses, and that would drive the prices down by the law of supply and demand). Purpose: To assess the proportion of disposable income which is spent on housing costs. (a) The measure say: “The ratio expresses housing costs as a proportion of disposable income”. What has this got to do with “intergenerational fairness”? Or indeed to do with age? It would be an interesting number if it brought age into the formula, but it doesn’t. It appears to be simply an observation about society. Purpose: To provide a measure of levels of housebuilding in relation to the need for new homes. (a) That sounds like an important topic. But what has it got to do with “intergenerational fairness”? If we simply want one group of people to have opportunities that are available to another group, that is good. The current state is unsatisfactory, unacceptable, wrong, etc. But not “intergenerationally unfair”. It isn’t the result of one generation not playing by the rules, or impeding another. It isn’t about “relationships between children, youth, adults and seniors, particularly in terms of treatment and interactions“. (Just as the shorter life expectancy of earlier generations isn’t “intergenerationally unfair” because it isn’t the result of one generation not playing by the rules). Some things are “happenstance” and may be regretted by all generations. (This illustrates the importance of defining “intergenerational fairness”! Without that definition, it is impossible to determine whether this paragraph trumps the assumptions of the IF Index). (b) The measure says: “The ratio expresses the numbers of houses built as a proportion of the number of households. A decrease indicates a reduction in intergenerational fairness”. What on earth have the number of households got to do with anything? Surely what matters is the number of houses built as a proportion of the family units that want houses but haven’t got them? If all family units that wanted houses had them, we could stop building – but that would register in the IF Index as “a decrease” and hence be “a reduction in intergenerational fairness”! It is a formula that doesn’t match the problem to be solved. (c) The consensus is that we need lots more houses. I agree. Purpose: To assess the changing cost of the state pension in relation to the size of the UK workforce. The measure of the UK workforce is used as it will be those who are currently in that force who will be paying for its costs. (a) The measure says: “The ratio divides the total cost of the state pension by the numbers in the UK workforce”. This is an interesting number, but what is a “fair” ratio? How should a “fair ratio” be calculated? Without knowing that, it is impossible to determine the fairness of any trends – obviously there are some ratios that are perfectly fair, even generous, given the pensioners’ prior contributions to the “intergenerational contract”. (And to be pedantic: many people who are not in the workforce also pay taxes; some pay more tax than they receive as state pension). Purpose: To assess the changing cost of unfunded public sector pensions in relation to the size of the UK workforce. Purpose: To assess level of public debt per employed person. (b) Why “per employed person”? Potentially everyone can benefit from government borrowing, and everyone can be adversely impacted by national debt. It isn’t obvious how great the impact will be – it is nonsense to say that “children are born broke“! (Most people would find it hard to identify what impact the national debt has on their lives). 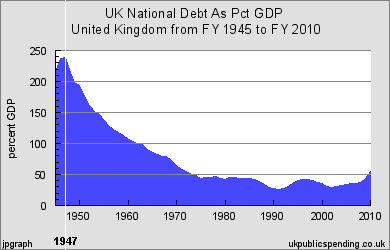 Important questions include “how much interest is paid on the debt”, which in effect is a leakage of tax-payers’ money, and “how much does the size of the national debt constrain the policies of government”, (by internal or external forces), which could be policies relevant to any or all generations. (c) The deficit is probably a more important measure than the debt. It is a measure of whether the government is in or out of control and making things worse for future generations. This may be what the IF Index is trying to measure by showing the trend of percentage changes of national debt, in which case perhaps it should not duplicate the work of deficit-watchers but just quote the deficit. I agree with the principle of deficit reduction as a precursor to debt reduction. Purpose: To assess the age of Councillors (excluding Town and Parish Councillors) as a guide as to the ages of those who make significant decisions about the places in which we live. (a) What is a fair age? As the population ages, what should we expect the average ages of councillors to do? (b) Perhaps a better measure would be the distribution of ages of councillors (and MPs, etc). It would probably be wrong to have just young ones. Perhaps we need a measure of how representative they are. Purpose: To compare levels of participation in voting at General Elections amongst younger people with the population average. (a) Why is it relevant here? If they don’t vote, it is a self-inflicted injury! Or perhaps they are satisfied with the way things are going and don’t feel the need to participate in the democratic processes freely available to them? Has anyone asked them? Purpose: “To compare usage of selected medical services amongst younger people (for purposes of this measurement, those aged under 60)”. (a) Why is “usage of selected medical services” relevant? If you ask young people what improvements they want for their health, will they say “we want more usage of selected medical services”? Wouldn’t we all like “better health without much usage of medical services”? For example, single inoculations against cancer, obesity, diabetes, tooth decay, to reduce lots of “usage” later? (b) What are the real measures of the health of young people, and how are these changing? Have they been asked? Surely “life expectancy” is important, and this is rising generation by generation. And whatever kills me may have a cure by the time later generations get it. Why aren’t those being measured? (c) What is the “fair” ratio between usage by people under 60 and those aged 60 and over? The IF Index plots the drop of the ratio from about 60% in 2000 to about 53% in 2010. But what if the “fair” ratio is 50%? Then this drop is increasing the “intergenerational fairness”! Why should anyone think the “fair” ratio is unchanging, when the population is aging? The IF Index provides no justification whatsoever to claim that the reduction is “unfair”! It may be “fair”. Purpose: To compare median income levels amongst the young to the population average (amongst those in employment). This is such a limited description of this major topic that it would be better to refer to external sources. Purpose: To describe the environmental impact of UK energy consumption. (a) That is too naive as a measure of the environmental impact of UK energy consumption. Why not just leave the purpose as “to describe the UK Greenhouse Gas Emissions”? Purpose: To describe the impact of climate change. (a) That measure says nothing whatsoever about the impact of climate change! Why not merge it with Measure A? Purpose: To describe spend on education over time. Purpose: To describe the costs of tuition fees for students in Higher Education (excluding Scotland). (a) There is a measure missing here: the proportion of people who become students in Higher Education. (It has grown from about 5% when I left school to about 35% now). Purpose: To assess educational performance over time. I don’t disagree with the principle of “intergenerational fairness”, and I don’t disagree with everything in the IF Index. But parts of it are not to do with generations, parts are not to do with unfairness, and parts of it don’t measure what their “purpose” identifies. A credible explicit definition of “intergenerational fairness” is needed in order to determine what subjects are in scope and which are not. It would also ensure that measures were actually related to “intergenerational fairness”! It isn’t valid simply to assume that any apparently adverse change from the 2000 value of a measure denotes “unfairness”. First it is necessary to determine a fair value for the measure concerned, or at least a direction where the fair value lies. Changes towards the fair value are improvements in fairness, changes away from it are increases in unfairness. It isn’t automatically “intergenerationally unfair” for one generation to have different characteristics from another. It becomes “unfair” when undesirable differences arise because of “treatment and interactions” among children, youth, adults and seniors, especially undue transfers of resources. The measures in the IF Index look like a set of “pet subjects” of all the people involved, matched against known available data whether or not it is the required data. There is no evidence that young people themselves were consulted about what is being published on their behalf! 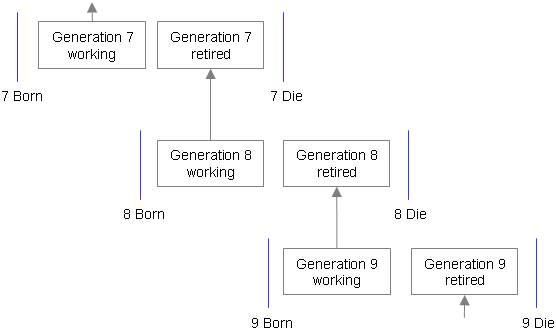 Below is a diagram from “Intergenerational resource transfers – summary“. It shows 2 stages not discussed in the IF Index: “Have children” and “Die”. Certainly “Have children”, which is a major trigger for intergenerational resource transfers, should be included.